There has been renewed interest of late in the age-old theory that Sherlock is heading towards a point where John and Sherlock will enter into a romantic relationship. The interest springs from the intriguing latest trailer for the new series which sees the detective uttering the immortal words “I love you” to someone unseen. My money says that Sherlock says “I love you” to John’s baby! I hope he falls for a beautiful woman just as mysterious and intriguing as he is! Of course he is gay. John might not be but Sherlock is gay. Just admit it! John is probably bisexual. If you do some research online you will find lots of proofs for this theory. Well, it’s pretty obvious they weren’t ever meant to be a couple. The showrunners made a mistake, I think, when they tried to play with this theme as a long-running joke, and now they’ve got a lot of the fans who before 2010 knew nothing about SH thinking that’s what it’s meant to be from the beginning. After I’ve read ypur comment several times I am quite sure that you are serious and you’re not being sarcastic. So, you’re trying to tell us that you actually believe that Sherlock Holmes is a heterosexual man? Where should I start? Maybe at “A Study in Pink”, the restaurant scene. “Do you have a girlfriend” – “Girlfriend? No, not really my area.” – “Oh. So, do you have a boyfriend then? Which is fine by the way…” – “I know it is fine, but no”. Okay, he isn’t attracted to women, we know that. But not being attracted to women doesn’t mean you’re gay. He could also be an asexual, but same here. He didn’t deny that it could be possible for him to have a boyfriend, he just said that having a girlfriend is not his area, didn’t he? Well, it doesn’t surprise me as much nowadays that people give so much importance to that dialogue, just because I’ve seen it a lot lately. But seriously, that dialogue is clearly meant to poke fun at the situation of them two there. The humor is pretty obvious: first the restaurant owner thinks they are a couple, then John mistakes Sherlock’s “not really my area” to mean that he isn’t into girls and thinks Sherlock is gay, then Sherlock mistakes John’s inquiries for “interest”… and it all gets cleared away in the end. It’s pretty clear for me that Sherlock’s “not really my area” is a reference to romantic relationships per se, not girls as opposed to guys. It states who Holmes is: he doesn’t do relationships and he has archenemies. There is really no more evidence in Watson and Holmes’ relationship that either of them is gay or bisexual than there is in any normal close friendship. If you have two people who are very close and understand each other so well, etc, it’s obvious that they’ll appear to outsiders to be a couple at times, which is precisely the long-running joke the showrunners go with. There are no gay jokes in Sherlock. There are only moments when gay relationships are mentioned or speculated. If you find yourself laughing at these moments it is because you find the idea of homosexuality laughable. “Sherlock thinks John is was hitting on him! That’s hilarious!”, “Mrs. Hudson thinks John is Sherlock’s boyfriend! HAHAHAHAHAH”, “Jeanette called John a great boyfriend.. to SHERLOCK HOLMES! AHAHAHA! 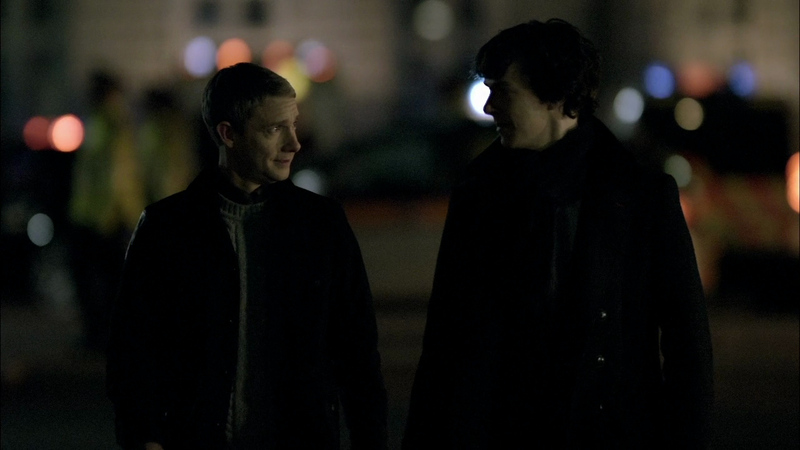 !”, “That gay couple just asked John if Sherlock snores! HAHA WHAT!”, “Irene asks John if he was JEALOUS of her her omfg what that’s a good one!”. The only time we hear something that resembles as a gay joke we see Sherlock’s moping face and if you still think it is funny or you are laughing at gay subtext in BBC Sherlock you should really reconsider and think about how you watch TV. Nah, don’t try to stake a claim for the truth here. This may be how you view it, but it’s just your opinion based on your theories—not on how the show is presented or on what the showrunners state. What if I tell you that the show represents it exactly like this? I am alright with people thinking that Johnlock isn’t real, but I am not okay with people trying to say that BBC Sherlock is a queerbaiting show. Do a simple test: go on Wikipedia and read the article on the show. See? That shows that it’s not portrayed as gay. As for queerbaiting, I don’t see how people can accuse them of that when the showrunners have stated more than ten times that it’s not a gay relationship, not ever going to be. You can say that, but like I said, it’s just a theory. And when it turns out that johnlock won’t ever happen, you shouldn’t say the show is queerbaiting—it’s a bit unfair to refuse everything the showrunners say and then later on accuse them of queerbaiting, it just won’t stick. The only queerbait is in people’s minds, just because they theorize far too much. Thank you for putting it so well! I see the pattern in Sherlock, is subtext, is there… is the same as Mulder and Scully, they are each other’s rock, they put each other before others…etc.. Call me crazy but at least in the show, sherlock and john will end up again at baker street, just the two of them againts the world even if Mofiss decide not to make it romance.